In sustainability, as in others areas of business, there are consequences associated with making decisions without taking tradeoffs into full consideration. Having a balanced evaluation of multiple attributes of sustainability will allow your company to determine which are most consistent with your values and business objectives and to effectively communicate your strategic decision to stakeholders. Research from the Center for Food Integrity shows that being able to explain how and why you make decisions is an important factor in building trust and reducing stakeholder outrage. Any given agricultural or food production practice has an impact on one or more of the three large dimensions of sustainability. It is important to consider the impact of a practice or policy on specific attributes across and within each dimension. The challenge with evaluating tradeoffs is that the analysis is nearly always incomplete due to the complexity of food production systems. It is difficult and not generally cost- or resource-effective to identify and quantify all the potential impacts and definitive research or data may not be available. For these reasons, the goal in evaluating tradeoffs is to provide strategic direction using qualitative and quantitative data. 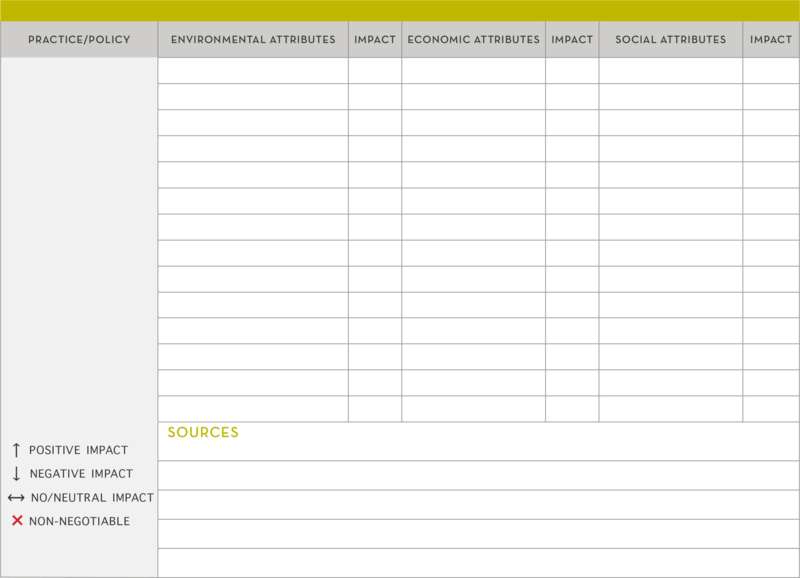 In many cases, you may be asked to assign a value to a specific sustainability attribute based on data and your priorities and current policy. While this process will not provide an “apples to apples” quantitative comparison, it does provide a framework that allows you to transparently evaluate sustainability tradeoffs. Once you have narrowed your list of attributes in Step 6, it’s time to more fully explore the trade-offs and implications of each to avoid unexpected consequences or conflicting outcomes. 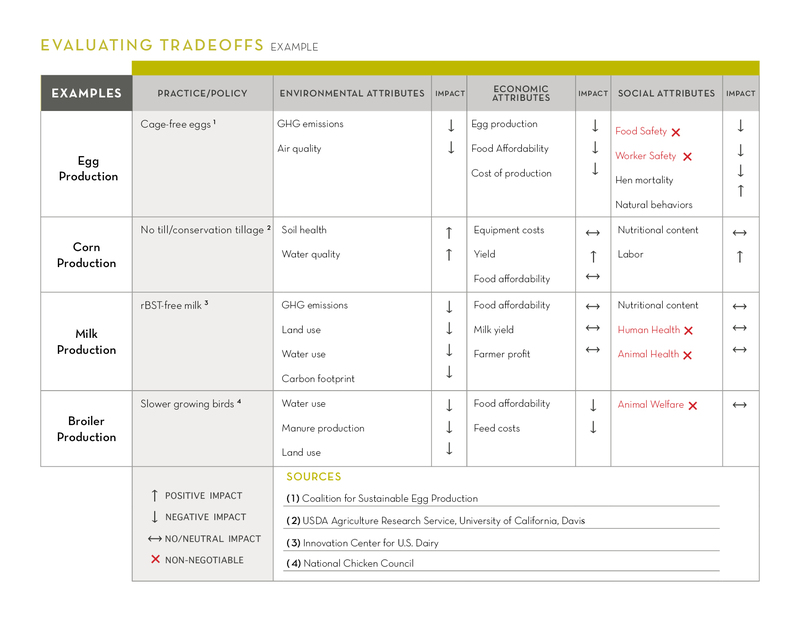 Go to the Evaluating Tradeoffs module for a four-step process to evaluate the tradeoffs that are inherent in choosing sustainability priorities. Once you have worked through the tradeoffs exercise, return to Step 8. Recognize that there is often tension between the economic and environmental or social domains, particularly if technological solutions do not yet exist for an issue. A practice that is better for the environment may be more expensive, at least initially, so may negatively impact the economic attribute of farmer profitability or social attribute of food affordability. Strategies to address this issue may include establishing return-on-investment criteria (prioritize break-even or positive ROI projects) or committing to invest in improved processes or in research to develop more cost-effective solutions. Efficiency is generally considered an economic consideration but in reality can have environmental and social benefits. For instance, consider land use. Green Revolution pioneer Norman Borlaug advocated increasing crop yields as a means to curb deforestation. Farming intensification is economically positive in most cases, using less land, water, energy to get a certain amount of yield. However, every system has a tipping point where additional gains are no longer practical, so the goal should be to optimize rather than strictly maximize efficiency. An optimization strategy that works in one area won’t work in others. Certain things are not “tradeable.” Food safety, worker safety, endangered species habitat are a few examples of attributes that may be considered sacrosanct and not available for a tradeoff. These “non-negotiables” should be clearly defined to secure alignment on what won’t be compromised for another attribute of sustainability.